Stack Overflow Tag Manager is a Greasemonkey script for expressing your tag preferences, which partly inspired Stack Overflow's own tag preferences feature. Continued benefits over using the built-in version are that tag display preferences can be customised in-place (and immediately applied) and you can restrict display of questions to only those which have your favourite tags. The script's sidebar module allows you to specify tags corresponding to subjects you're not interested in, hiding or fading questions with these tags in the main question listings. 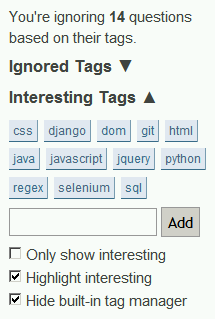 Tag input fields make use of Stack Overflow's tag-autocomplete functionality and hovering over a tag's name makes use of the existing hover functionality. Asterisks can be used as wildcards to filter out tags whcih have multiple variants. To delete a tag, left click it. Clicking the arrow in the heading will toggle display of the section. Ignored tags can be hidden or faded by choosing the appropriate option. You can also specify tags for the topics you're most interested in, to help you more easily find these questions. Middle-click a tag to view the corresponding tag page (wildcards are stripped from tag link) - left click is still deletes. Highlight interesting - makes your favourites stand out. Only show interesting - only shows questions which have your favourite tags. 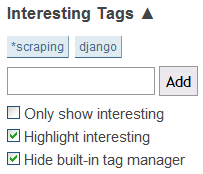 Hide built-in tag manager - hide Stack Overflow's own tag preferences UI from question listings. As of March 11th 2011, the script adds a "Show tag details" checkbox to the updated Tags page, which allows you to toggle between an old-style compact view and the new detailed display of tags for easier browsing, persisting your preference. Update by installing the script again over the top of your existing installation. Stack Overflow Tag Manager is available from userscripts.org. If userscripts.org is down, you can grab it from my GitHub greasemonkey repository, which is also the place to go to report issues, suggest new features and changes, and contribute code. Call it SE.css and save it somewhere - then tell Opera to use it for your SE sites. (need to set it per SE site).